Archibald Erskine (1830-?) was a carpenter from Scotland. His petition for naturalization in 1879 states that he lived at that time at 136 W. 24th St., Manhattan. And he is probably the Archibald Erskine who sailed from Glasgow on the SS Caledonia in 1867, who is described as "Archibald Erskine, age 36, joiner." The Caledonia arrived in New York 3 Aug. 1867. Erskine is recorded in the U. S. Census of 1880 living on West 24th St., now age 49, carpenter, born Scotland. Even in the U. S. Census of 1900 Erskine continued to list his occupation as carpenter. Trow's New York City Directory in 1897 is the first to record the Erskine printing business on East 13th St. At that time the business was located across the street at 22 E. 13th St. Previously Erskine was in a partnership with Robert McGregor, carpenters / builders, at 112 W. 19th St. In Trow 1897 Erskine is both builder at 129 W. 17th St. and printer at 22 E. 13th St.
Two of his sons, Archibald Erskine, Jr. (1869-?) and George C. Erskine (1872?-?) worked with Archibald Erskine at Erskine Press. 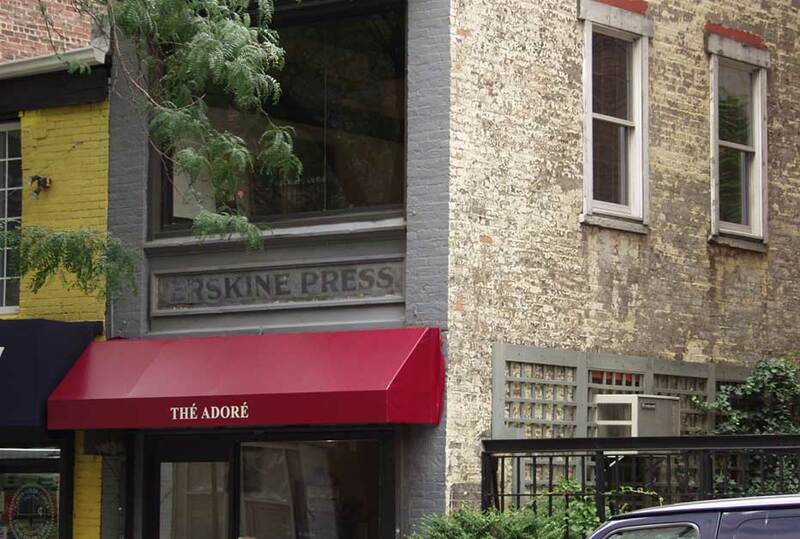 Erskine Press moved from 22 E. 13th St. to 17 E. 13th St. in 1911/12. The original Archibald Erskine seems to have retired before that date. His entry in the 1910 U. S. Census records his occupation as "None." The business seems to have been carried on from the 1910s by George C. Erskine. He was still recorded as a printer in the 1930 census. The demise of the business is unclear. The last listing for Erskine Press in the Manhattan telephone directory was in 1917, but Polk's city directories continue to carry Erskine Press at 17 E. 13th through the final issue in 1933-34. Erskine Press apparently were the original tenants of 17 E. 13th St., which was constructed in 1911. According to plans filed with New York City Dept. of Buildings (available online at http://www.metrohistory.com) the architect was G. T. Goosey. This was probably George Turland Goosey (1877-1947), who was an architect in the U. S. before moving to England to pursue a career as a painter.